Nothing comes close to the excitement and fun of a Rib Blast. Capable of stunning speeds and yet safe in all sea states, these immaculately presented Ribs are an adrenaline high. 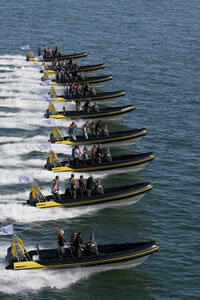 Our Rib Blast Events take place on the River Thames or in the Solent, on the South Coast. Guests will be met either on the banks of the River Thames, Southampton or the River Hamble. Guests are provided with protective clothing and after a safety briefing will be blasted across the water at high speeds in close formation passing all the points of interest. As there are no speed or weather restrictions the qualified driver’s can demonstrate the amazing handling of these ribs providing an event to thrill. Our fleet of Ribs allow us to entertain groups of 8 up to 200 clients offering a fun and exhilarating accompaniment to a meeting or conference or just great for incentive to motivate staff. The Ribs are not only fast, fun and safe and immaculately presented but have also been ‘coded’ by the Coastguard and carry full and proper insurance. Designed for the outgoing, a Rib Treasure Hunt provides both thrilling and competitive entertainment. Board the identical matched fleet for a stunning high speed close formation blast through the Thames or Solent. The teams both have land and sea clues to be solved in several locations. After being issued charts, clues, stop watches, Polaroid cameras, and challenges to complete, every team member will be able to take the lead in tasks ranging from the logical to the outrageously creative. The day can include bacon rolls and coffee on arrival and lunch. Please call our Sales Dept for more information on 01825 760065.